WOULD you let a robot look after your child? Would you want one to be your friend? Should robots look human? These and many more questions are posed in the fascinating Manchester exhibition — Robots — featuring more than 100 androids and automatons spanning the last 500 years. Yes, 500. Early examples include wooden religious figures with simple mechanisms that would have astonished our ancestors. Then there’s a tiny but horrifying metal house spider and a robotic wine goblet that enthralled 18th-century fine diners. Glamour is provided by a sprinkling of movie celebrities including a replica Maria from the world’s first sci-fi film, Metropolis (1927) and a T-800 Endoskeleton from The Terminator. 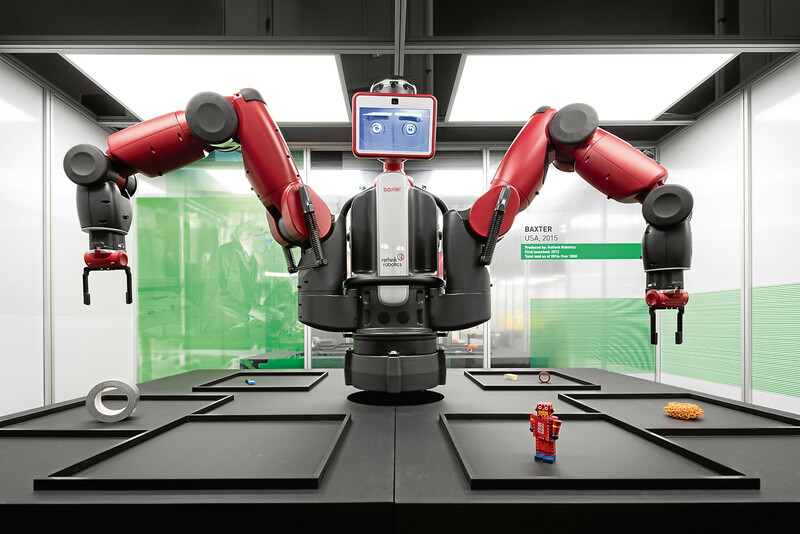 The stars of the show, though, are to be found in the gallery of 21st-century bots, offering a riveting insight into the impact robots have on our everyday lives. And that includes the pioneers of the 1950s, such as Cygan. He actually sold at auction five years ago for a whopping £17,500, such is his popularity. He is 8ft tall, and wowed us with his advanced abilities five decades ago. Cygan could move forwards, backwards and crush drinks cans! Fast forward to the present day, and you’ll see a “human baby” suspended and spotlit against a white wall. It blinks sleepily against the light, moving just enough to silence everyone staring at it. And everyone does. Disconcertingly lifelike, it is an automaton for use in film. Robots are a form of trickery — lifelike, but not alive. Already we are on our guard. Most of the 21st-century robots on display are humanoids, in other words shaped to resemble people. But why do we do that? Some roboticists believe machines need body mechanics that operate like ours to perform the way we do. To achieve the complex grip and motion needed to pick up a straight-sided glass for example, they should have shoulders, arms and fingers with alternatives to our tendons and muscles such as cables and motors. One such model is Eccerobot. It looks just like it has been lifted from a page of a medical textbook. Built in 2009, it has anatomy so similar to our own that it also proved to have our own design faults. It eventually acquired a twisted spine, stiff joints and a dislocated shoulder! Another challenge for humanoids is walking. It is so tricky on two legs that it’s amazing we humans manage it at all. Some robots, such as Toyota’s Reception Robot, Robina, swerve the issue by having a wide base with wheels. But there are times when legs are necessary including when climbing stairs and crossing uneven terrain. But bots have come along way — far enough to have their own Robot Football World Cup. The robots act autonomously. They adjust their movements according to changes of position in the ball and other players. Robots are also useful to manufacturers — but a definite threat to our human workforce. Take Baxter, for instance. He appeared on the scene in 2011 and is used for simple industrial jobs, such as loading, unloading, sorting and handling materials. In short, Baxter does the boring jobs that unskilled humans used to. Communication is another key focus of the exhibition. Robots can “talk” and can interpret human speech. We already have home computer hubs that will tell us the weather, order food or turn the room blue just on vocal commands. But humans also communicate through our tone, body language, gestures and facial expressions. Robots are beginning to read — and use — all of these. Kaspar, my favourite robot, has a deliberately simplified, non-naturalistic face. Toddler-sized, this robot helps children with autism build social skills and confidence. As a child’s playmate it is unthreatening, doesn’t take offence and with touch sensors on its body, can politely tell friends when they are being too rough. But some robots have been made to look as human as possible. They are by far the most disturbing. Kodomoroid is a Japanese bot and the head and teeth were cast from a real woman. Its flexible silicon skin resembles human flesh and the effect is distinctly creepy. The Robots Exhibition is at Manchester’s Museum of Science and Industry until April 15, 2018 and will then tour to Newcastle and Edinburgh. Adults £8. Children £5. Age under 6: free. Who are the protesters on the Extinction Rebellion frontline?